I say mostly painless because as I was cautioning a staff member to be extremely careful as we were walking between two buildings where some roof debris had fallen, I had the painful pleasure of stepping smack-dab on a nail. Of course, I was wearing basically sole-less Yosi Samra shoes. These shoes are great for the 6000+ steps I walk everyday. Not so good for muddling around a construction site. All is well now except my arm is still sore from that tetanus shot. Anywhoo, I got home that evening and found a great surprise on our doorstep. A box from Uncommon Goods. Uncommon Goods was a sponsor of the recent #FreshTastyValentines event and every blogger that highlighted the company in a post received a $50 gift certificate. Score, right? I had to share what I ordered. A Turkish Tastes of the World Cooking Kit and a Very Veggie Spice Collection. The kit itself contains red bulgur, shawarma seasoning, urfa biber, aleppo pepper, and kokte seasoning. The name of Larson’s company is Saffrons+Kumquats. I love it! I also can’t wait to use these ingredients and highlight her recipes here soon. I think I am most excited about the Warm Yogurt Soup with Rice and Chickpeas. 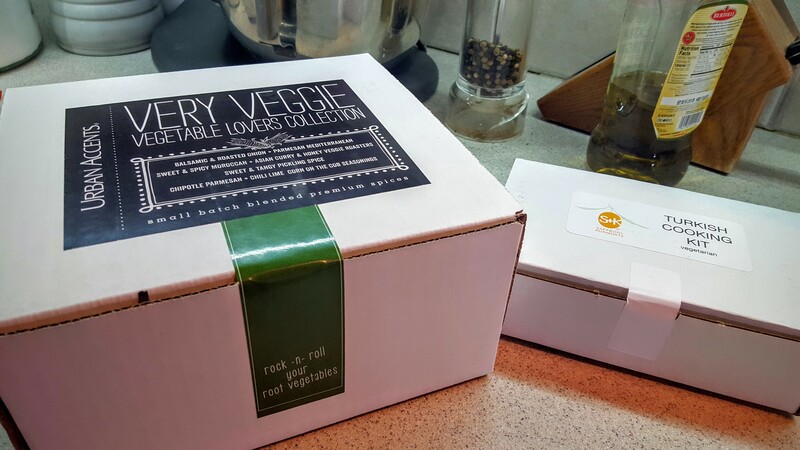 The Very Veggie Spice Collection is “small batch crafted” and packaged by Urban Accents. 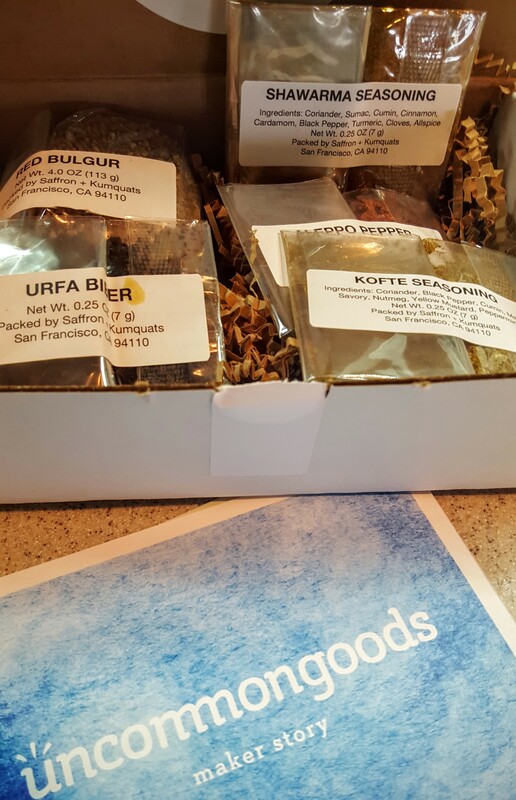 This box contained a plethora of spices that will come in most handy for the spring and summer months. 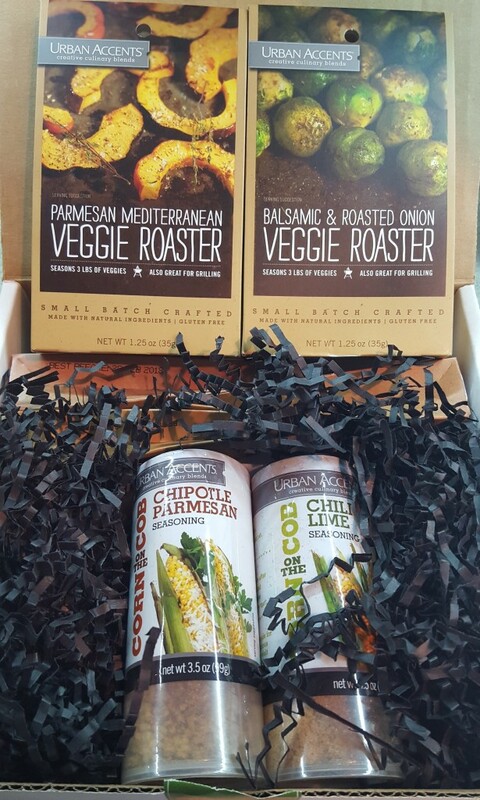 It includes “Veggie Roasting” combinations in the following blends: balsamic & roasted onion, Parmesan Mediterranean, sweet & spicy Moroccan, and Asian curry & honey. I also received two bottles of corn on the cob seasonings in chili lime and chipotle Parmesan. Lastly, the box contained a package of sweet & tangy pickling spice. Very Veggie Vegetable Lovers Collection. Seriously, I cannot wait for the first carrots so I can use the Asian curry & honey blend. Or, the first brussels spouts for the balsamic & roasted onion. Or, the first beets for the sweet & spicy Moroccan. The possibilities are boggling my mind at this point. Thanks again to Camilla from Culinary Adventures with Camilla who hosted the whole #FreshTastyValentine event and worked with Uncommon Goods as a sponsor to get us those $50 gift certificates. I love a package with my name on it. This sounds like a wonderful one. Sorry to hear about your foot. Ouch! I can’t wait to use these seasonings! I don’t see how you can blame yourself when a construction company is behaving irresponsibly! I hope there are no consequences from your injury. Enjoy your spices. Honestly, there were being super careful. I blame it on that dang-nab Oklahoma wind for blowing stuff EVERYWHERE. Have tried some of the corn-on-the-cob seasoning on potatoes. Pretty tasty. Oh gosh, I’m sorry to hear about that nail! Hopefully it wasn’t too painful and you’re recovering nicely now. I love all these spices you received in the mail! Reading the descriptions are making me hungry! No worries about the foot. Still trying those spices.